HandKrafted by Stephanie: Taylored Expressions June Stamp of the Month Blog Hop! Taylored Expressions June Stamp of the Month Blog Hop! Hello! 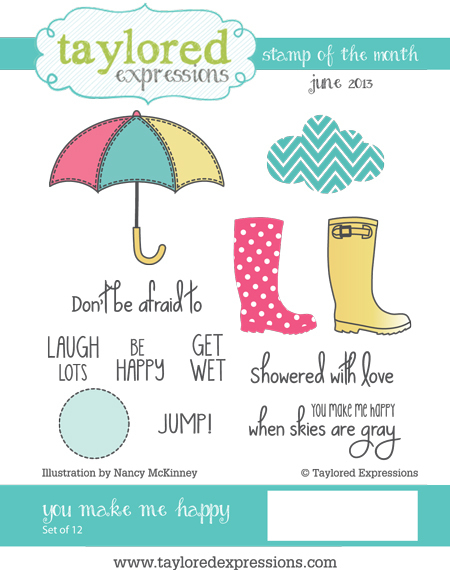 Welcome to the Taylored Expressions June Stamp of the Month Blog Hop! You might already be familiar with the TE Key Ingredients, well now Taylor has added a TE SOTM (which will coordinate with the Key Ingredients. You will have the option to subscribe to either one or a combined Deluxe Key Ingredients which includes both! Here is a link all of the subscription options. 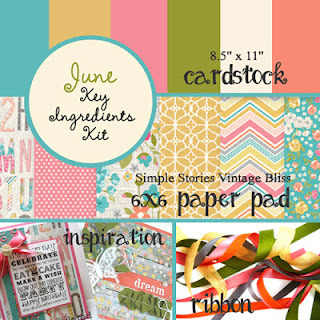 I combined the June Stamp of the Month (You Make Me Happy) with the June Key Ingredients (featuring patterned paper from the Simple Stories Vintage Bliss collection) to make a 6x6 scrapbook page. 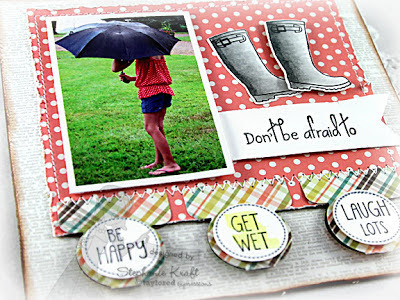 I also used the coordinating Rainy Days Dies (sold separately). All patterned paper and cardstock are from the June Key Ingredients. The sentiments and welly boots are from You Make Me Happy. I used the Rainy Days Dies to die cut the boots and to make the trio of tabs on the bottom. Accessories: Taylored Dies: Rainy Days, Banner Stacklets 1 (Taylored Expressions); 1" Circle Punch (EK Success), Markers (Copic), Distress tool, Foam tape, Thread, Sewing machine. What a funny & sweet story! Great shot too, I really should take more candids of my kids. Love your layout and the "Don't be afraid to" really fit the picture well! Hugs! What a sweet page Stephanie. Love the boots and those stitched tabs. Pretty paper. What a super page! Love the story behind the photo - really made me smile! What a sweet page Stephanie and sweet story behind it! Really adorable page....and love the picture! What an adorable scrapbook page! I like the way the dotted paper coordinates with her top, and I love that you added the 3 statements at the bottom. Aww, What an Sweet Scrapbook page of Sabrina Stephanie and love the story behind it too! And you couldn't have a better set to showcase both! Adorable layout! Fun picture and great way to tell a story!